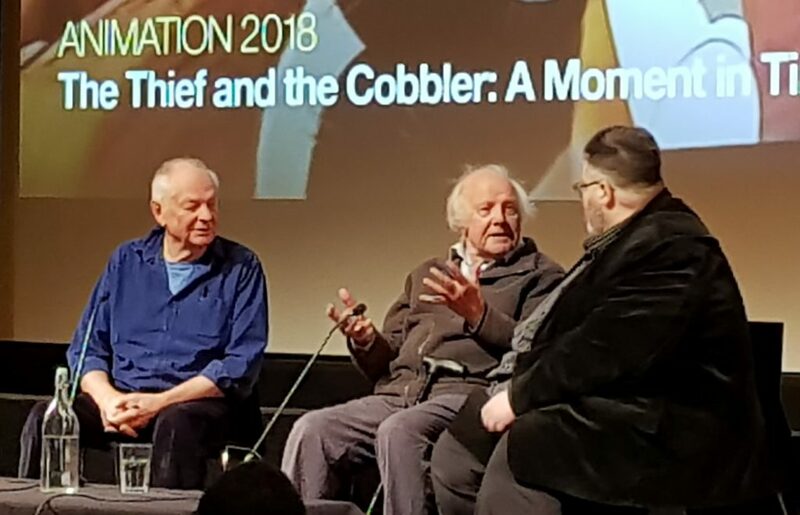 The Thief and the Cobbler: A Moment in Time, BFI 2018 Q&A. The great unfinished feature film of Richard Williams. Made over a period of 25 (or more) years, it has become a legend for animation fans, both for its beauty and its rarity (and probably controversy too). The tale is of a golden city that will live in peace and prosperity as long as the three golden balls remain on the highest pinnacle of the highest tower. But stolen by the Thief, the town is thrown into disarray and danger, and only the simple soul of the Cobbler can return the town to safety. Inspired by Middle Eastern folk tales and Persian miniatures, it is possibly the most beautifully animated film of all times but has only ever been seen in its original form (the most complete directors edit) twice. The reason why it is unfinished, and unseen, remains controversial, and it’s fair to say that even the start date of the film might be considered controversial. But to summarise maybe too briefly, after decades of working on the film, in 1988 a funding and a distribution deal was negotiated with Warner Brothers to complete the film. But by 1991 there were issues with the completion date and eventually a Completion Bond Company took over. Meanwhile Disney was in production with Aladdin (1992), which has a striking resemblance to the story, style and characters of the Thief. 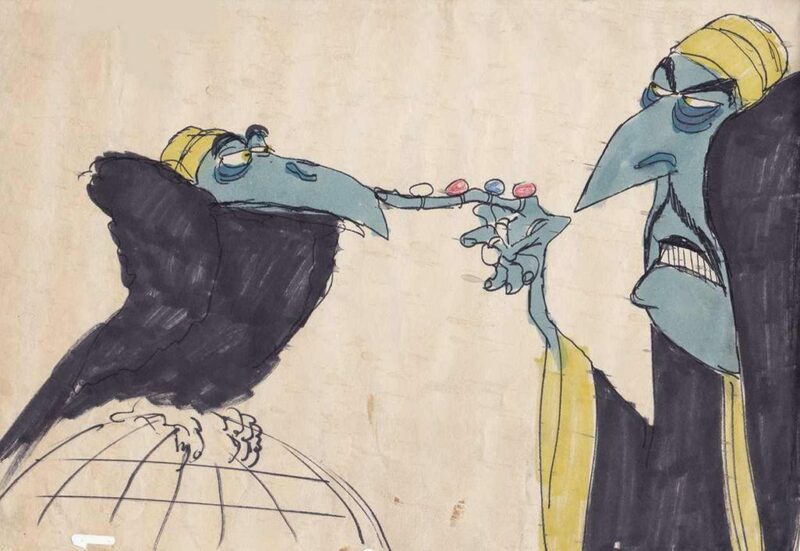 Early drawing of ZigZag and his vulture by Richard Williams, 1970-73. Image from Traditional Animation blog. Concept art of ZigZag’s lair by Errol Le Cain, 1970s. Image from Traditional Animation blog. 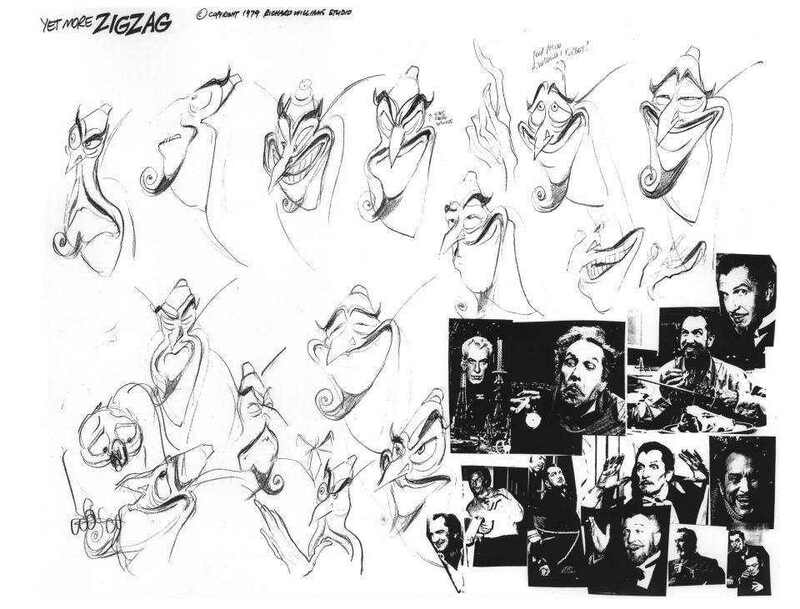 Model sheet of ZigZag, based on the voice of the character, actor Vincent Price. Drawn by Richard Williams, 1979. Image from Traditional Animation blog. It was never released in the UK. But it was edited, with new scenes added, then released in South Africa and Australia by Allied Filmmakers as The Princess and the Cobbler in 1993, and then edited further and distributed by Miramax in North America as Arabian Knight in 1995, after Miramax had released Disney’s Aladdin in 1992. Neither version was accepted by the Director, Richard Williams. It seems that the three golden balls were indeed stolen from the production pinnacle and we are waiting for a simple soul to return them so that we can all get to see this great film. There are many stories, viewpoints and ideas to be found, but it will be hard to decipher the real story as Richard Williams (and producer Imogen Sutton) do not want to talk about it. It is still an incredibly painful topic, but they agree, leave the past behind, its done, let’s look to the future. In London, November 2018, for the second time only the public were able to watch the directors work print from 1992. It had been shown only once before in 2014, and on introducing the print, to the packed auditorium at the BFI, this time Richard was almost in tears. Here is a summary of the talk he gave afterwards. He has very rarely talked about this film before, so it is a unique honour for me to be able to share this with you. 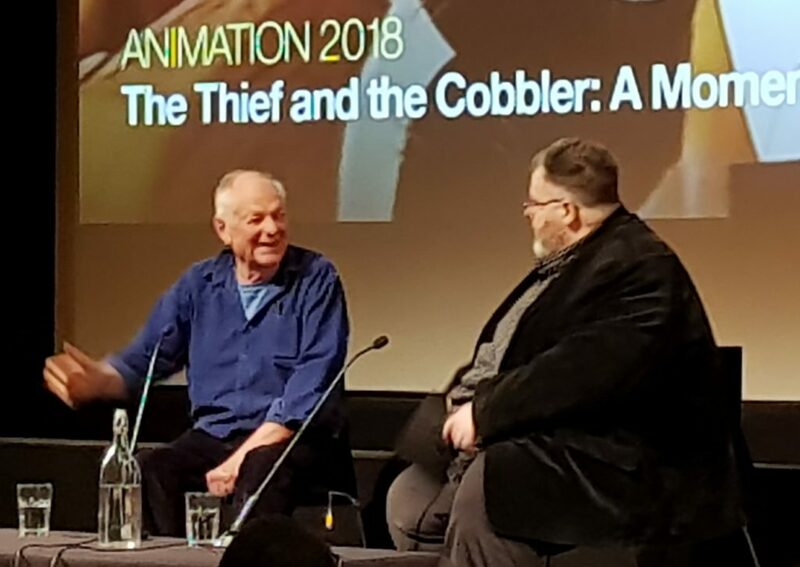 Richard Williams at the BFI Q&A, 2018. In 1992 an overnight ‘slash dupe’ was made of the cutting copy of the film, this work-print was miraculously saved, and can now be shown as an historical film document in the UK. It contains sections of pencil sketched animation, animatic sections, layouts, as well as sections of completed rendered animation. The soundtrack is also incomplete, the voice artists are all recorded, as animation is done to these tracks, but some of the music is temporary placeholder and some sound effects are missing. This adds another layer of interest and charm to the film, especially for animators and animation fans and enthusiasts. 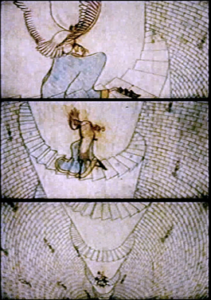 It highlights the process of hand-made animation before the digital era. Every frame of the film is hand-drawn, hand-traced, and hand-painted, maybe the last of its kind. This is a work in progress, with no credits. It’s the last work of a bunch of great animators from the golden age of animation, Ken Harris, Art Babbitt, Grim Natwick, Cliff Norburge, and the younger artists Richard Williams, Alex Williams (his son), Roy Nesbitt, Errol Le Cain, Neil Boyle, Tim Watts, Paul Boulger, Courtney Cole, Russel Hall, and many more. May 1992, a large screening room, the crew gather to view the film so far, most are sitting on the floor, we’re in mid production and everything is going smoothly. This is the work print, we are together and exited to see how the film is coming on. 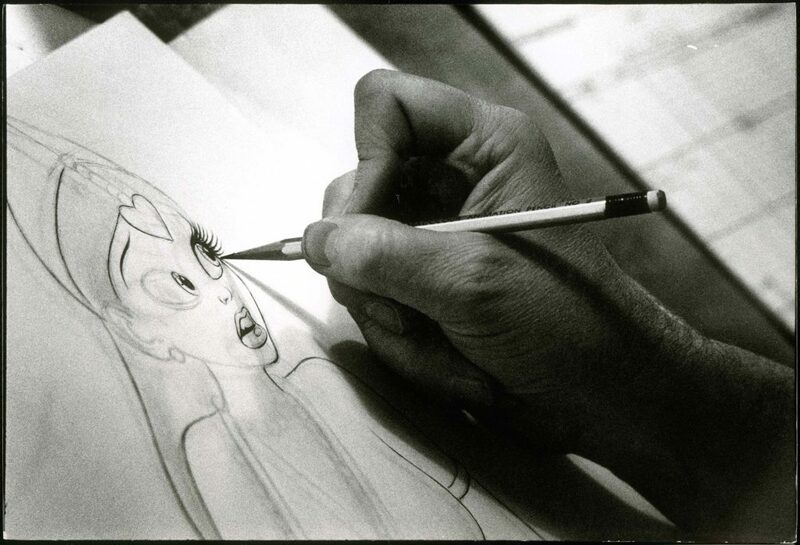 Richard Williams Studio, in the heart of Soho, made advertisements in order to fund the film. This film was a labour of love, and the money from his more lucrative commercials and film projects were ploughed into making it. He used the profit from his advertising work to fund the film at first. A large amount of the film was done before they got any outside funding. A lot of the battle sequence was done for example. So in between commercial projects he put the team on sections of the film. In fact there would always be someone working on the film, whoever was not working on a commercial would be working on the film. 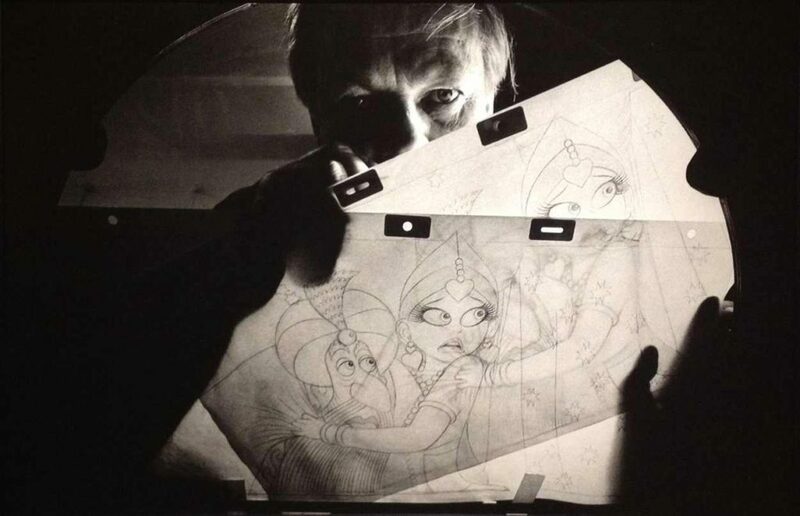 Ken Harris, who animated the thief, was almost always working on it, when he wasn’t doing the Pink Panther titles and the Christmas Carol (he animated Scrooge). So for 20 years the animators were constantly interrupted during their work on the film, to pause and make a commercial. The Who Framed Roger Rabbit film, also brought in the money to work on this feature, that’s why he did the Rabbit. Over that time animators were coming and going, and shots were often redone several times. Pencil drawing of a rough animation test of the scene where the Cobbler and the Thief become tangled up. 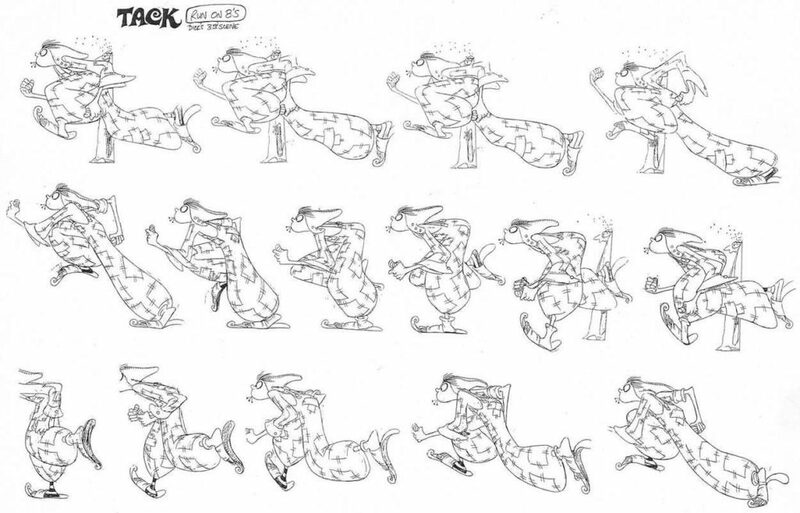 From a rough animation test by legendary animator Art Babbitt. 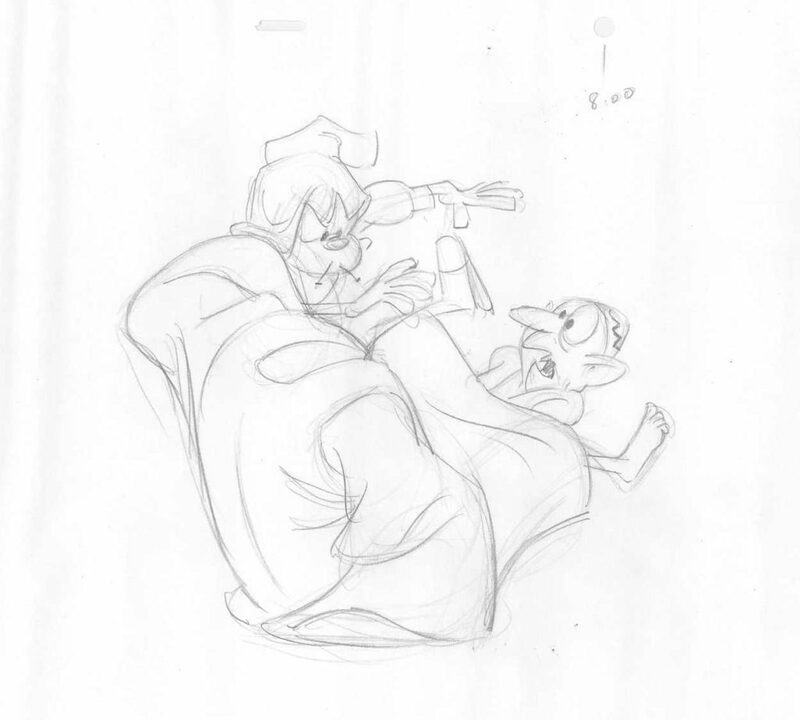 Image from the Traditional Animation blog. After 20 years they got money to finish the film. At that point it became a full time production, and they expanded, and moved to the same place in Camden Town (London) where they had made Who Framed Roger Rabbit. Up until that point they had total freedom and control over the film. It was a very smooth production, unlike any other, until the trouble started. It had to be completed by a certain time else the funders would pull it and finish it themselves. They eventually took everything including the artwork. The crew didn’t know what was going on, they were protected from it and carried on working. Luckily the work print was preserved and kept, and they did the restoration themselves at Technicolour in London. The politics of completion is no longer important to him, it’s not relevant anymore, what’s important is that we do have this copy of the film. It pushed the boundaries of what is possible in animation, and we have to look forward from where we are. Appreciate what we have remaining. He jokes that animation is a lot of work, but he chose it, and the other animators working with him also chose it. But that doesn’t make it any easier! He has always loved Persian miniatures, so the designs are inspired by them, both shapes and colours. A kind of grotesque version which could be animated, because the Persian miniatures are flat and he needed them to be rounded and to move like a cartoon. They worked with the voice talent all the way through. Kenneth Williams did the voice for the Vizier, and many other characters too. He wanted Vincent Price to do Zig Zag, but Kenneth ended up doing that too. Over the years he got very old, but he still added more voice work to the production. 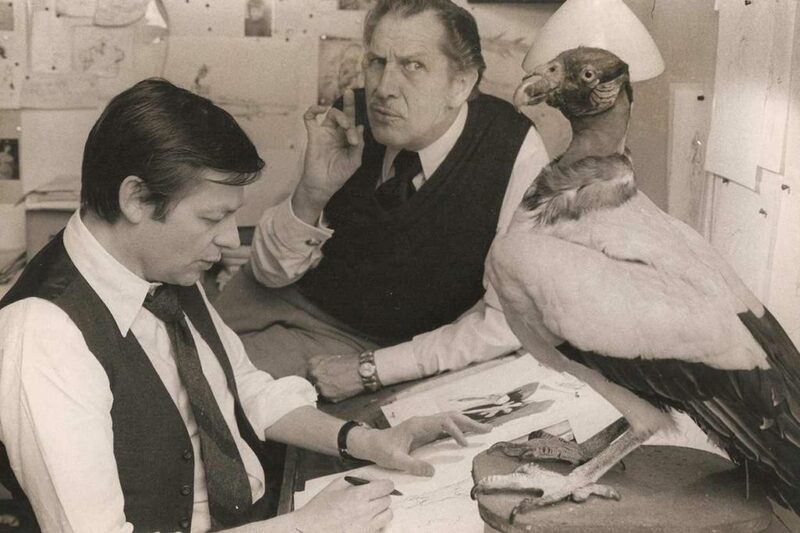 Richard Williams and actor Vincent Price develop their villainous character, who eventually became ZigZag the Grand Vizier. At the studio at 13 Soho Square, London, 1970. Their collaboration is discussed (with several more images) in a deleted scene on the DVD. Image from Traditional Animation blog. The two main characters don’t speak, which became a problem later on. The Cobbler does say, “I Love You” at the end, he wanted Sean Connery to do that, but he didn’t in the end. Roy Nesbit did a lot of the story sketches, on napkins at the local ‘greasy spoon’. These would be blown up, and used to plot out parts of the story. Roy was anchor man for years. He worked on Charge of the Light Brigade, and Pink Panther, they did lots together. Planning the war sequence, was built up bit by bit, added to over time. The timing all works together. He went to museums, looked at reference, and built it up in between other jobs. Ken Harris came from Warner Brothers to work for Richard, sadly he died during the production, and Neil Boyle took over his place. He had to go through all Ken’s scenes and get to understand how he was thinking and what his intentions were. Neil had seen something about the Thief when he was 13 and had always wanted to work on something like that. He was amazed years later when he came to work for Richard and actually got to work on the Thief. Even though Disney offered him more money to work for them. After Who Framed Roger Rabbit many animators were taken on by Disney and moved over to them. But Neil turned them down to work on the Thief. Working on the Ken Harris scenes taught him more about animation, for 1 to 2 years worked with Ken’s stuff and so got to understand how he thought and animated. Richard Williams was Awarded an Oscar for his short film Prologue, one of a series, he’s working on the second one now with a working title of Will I Live To Finnish This! He jokes that his deadline is now his death line. Q: How did you stay so motivated for so long? Richard – because it’s so challenging. Can I do this… is it possible… pushing the limits of what has been done in animation. Neil – everyone had to raise their game. There was a friendly creative rivalry in the team, if one person animated a shot with 300 arrows hitting their target, the next person would see if they could do even more, to see if it was possible to make an even more extraordinary shot. They were kind of topping each other in what was possible. 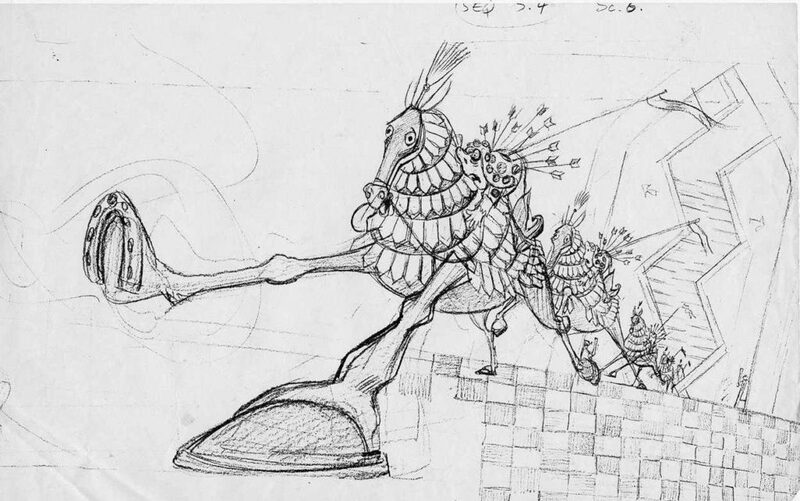 Rough layout drawing of the Dying Soldier returning to the Golden City by Art Babbitt. Image from Traditional Animation blog. Q: Will there be a DVD or a book about it? Maybe a BFI Blue Ray… This could be distributed in the UK, but not elsewhere. The UK distributer didn’t sign any deal to distribute the resulting film in the UK because they knew it was a labour of love and didn’t like what had happened to the film, so those rights are still available. It’s a complicated process to unravel what rights there are still, and if this can be done, then the BFI would love to release a version here. It also depends on whether there would be a big enough market for it, as being an unfinished film it is mostly of interest to animators and historians. Other films also have complicated rights ownership (Raggedy Ann and Andy), so there are many that he can’t release on DVD. He puts his time into making new films, that he does own, not looking back at the ones he can’t show. Q: How did you make it so funny? Ken Harris was the main animator of the Warner Brothers ‘Road Runner’ character, so he had great comic timing. He was the main animator of the Thief character. So he got him to bring some of that character into it. Constantly failing, falling over and then getting up, and that’s always funny. Tragic funny. Richard wet someone in Morocco who had bought himself a 15 year old wife, who looked just liked he had envisioned this kind of unpleasant character, it was a character that was tailor made for Ken. He knew what to do with it. The first thing he animated was the moment when the thief steals from himself, and then does a little dance. Although Ken himself was a great dancer he copied Richard’s dance, because it was not so good and therefore funnier. He caught this movement exactly, after only observing it twice. Q: What was the inspiration for Tack? He wanted a character who would compliment the Thief by being completely different. It was inspired by Harry Langdon, who moves in a certain way, like a dangerous baby. Q: Do you animate on 1’s? No, in my book I talk about animating on 1’s, but in practice I animate on I’s, 2’s, 3’s, 4’s, 6’s. If something needs to judder it needs to be on 6’s. But if it’s a fast action it has to be on 1’s. 2’s is charming as a style, so you can just do everything on that, if that’s the style you are after. But I use a range of speeds, 1’s for fast action, 2’s cushioning that, then as it pauses, 3’s or 4’s works well, so the hold is slightly alive. Use all the tools, but don’t be lazy and never use 1’s, because they have a use. Q: What frontiers are yet to be explored in animation. The personal and poetry in a film, like Michaël Dudok de Wit’s film The Red Turtle. You can see that it’s his work throughout the film. Here is the interview after the 2014 screening of the 1992 work print. The ‘Traditional Animation’ blog post on the Persistence of Vision documentary, for some of the images on this post, see the full post here. You can read more on Wikipedia here. Please share what you know about this film below, or even say whether you’d like to see the 1992 work-print released on DVD (UK only obviously!). Thanks Diane, glad you like it, and thanks for taking the time to leave a comment. Hmmn what a comprehensive fact. How interesting this piece of work would have been. The crew, director and all others involved really did a great work, went through a lot of things. Even if the DVD is distributed I can’t get it because I don’t reside in UK and I will love to lay my hand on it that’s if it is distributed. Thank you Lok, yes it is a shame that so much good work will never get seen. It would be nice if the companies that buyout the artists copyright could be persuaded to let these cultural artefacts be seen by the world, for the sake of cultural heritage and creative education at the very least. But thats a rant for another post. Wow, never hear about it before. I just was looking for a cartoon for my kids and this article showed up on my search results. It’s incredible how a project can be pursued with so many passion, even to keep investing own money and time on it during years. BTW, someone just told me is a remake of Aladdin coming soon. Do you know if it’ll be released this year? Thank you Carlos, this film often comes up in search results when people are looking for ‘The Princess and The Cobbler’ or even ‘Arabian Night’. 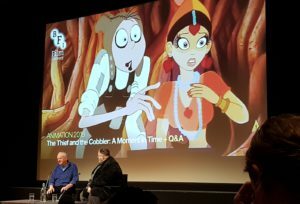 These are the edited and altered versions of this film that were released and often have the duplicate name of ‘The Thief and The Cobbler’, which adds to much confusion. Interestingly many animators do invest a lot of time and money in their own projects, its not rare or unheard of. This was a particularly large amount of time and money. Many artists (as well as animators) structure their businesses around making enough money to pursue their artistic dreams and endeavours. This original version of the film was developed way before Disney started Aladdin, and some even say that maybe Disney copied some of this film’s story and characters for their version of Aladdin. On the subject of remakes, Disney does tend to be remaking most of its films at the moment, so you can be assured that sooner or later there will probably be another version, and the trend is that it will be in photoreal VFX style film. Just last week, Disney released the first teaser trailer for The Lion King, a “photorealistic” remake of its 1994 animated film of the same name. More than 224 million people watched the clip in the first 24 hours!